Rodan and Fields is an award winning line of skincare products created by the two dermatologists that created Proactiv Solution, Drs. Katie Rodan and Kathy Fields. In 2002, the doctors had a vision to bring dermatology grade skin care products to the masses. They originally launched these products in high-end retail and there they did really well. But the doctors knew they could reach more. Despite being the number one clinical brand in Nordstrom, they decided to pull out of retail, knowing the the majority of people were buying based on referrals from friends. In 2008 they launched into direct sales and sold more in that channel in one month than they did in one year on all of the Nordstrom floors! R+F is currently the #1 premium skincare line for anti-aging AND acne and #2 overall behind Estée Lauder! I've been using it twice per day for about three weeks now. I was pretty religious about applying it the first week and a half, but I got a little lazy as time went on (mainly during our baby scare). Still, I'd say I applied it, as recommended, twice per day at least 80% of the time. Here are my results. Before pictures on the left, after pictures on the right. Other than a tiny bit of mascara, I have absolutely no make-up on in any of these pictures. I'm not sure if it's super noticeable in these photos (unless you zoom in significanty, but that might be scary so beware! ), but I feel like the skin around my eyes just appears stronger and brighter. There are still wrinkles, but in my opinion, the wrinkles don't seem quite as deep as they were three weeks ago. I imagine with further use, it will only get better, and I've already mentioned to Jenna that I want to purchase some of this as soon as I run out! I also asked Jenna for her top five R+F recommendations. Here's what she said (in no particular order)! #1 \\ Soothe Regimen Step #2: This sensitive skin treatment uses patented technology RFp3 to protect against triggers that cause inflammation, breakout, and aging. This received an award for new technology! It instantly gets rid of redness! #2 \\ Redefine Overnight Restorative Cream: This cream works while you sleep! Sericin silk peptides stimulate collagen production and 12-hour time released antioxidants a, c, and e.
#3 \\ Redefine AMP MD Roller: This "best minute in skincare" patent technology is a noninvasive treatment that takes one minute to "roll" onto face, neck, and lips. It contains 200 micro-fine stainless steel needles to promote skin firming. 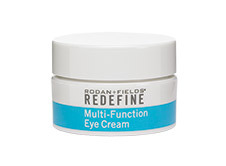 #4 \\ Redefine Multi Function Eye Cream: This cream includes peptides that minimize crows feet and calm and reduce the appearance of puffiness. It's gentle as water and the contents help to diminish dark circles, while the optical filters visibly brighten the eye area. **This is what I used! #5 \\ Reverse Regimen Exfoliating Wash: This facewash includes intensive brightening toner, dual active brightening complex, and broad spectrum SPF 50 sunscreen. It's awesome for dullness, dark spots, and sun damage. Bonus \\ Foaming Sunless Tanner: This tanner is not streaky, smells good, and results in a real glow! Because I love to help a friend out, and because Jenna loves R+F, she is offering free preferred customer enrollment (originally $19.95) to anyone who becomes a preferred customer in the month of July! PC perks include 10% off products, free shipping on all orders over $80, and management of your account making it super easy on YOU! If you are interested in learning more, or if you have any questions, you can check out Jenna's R+F website or email her at jackson6486@gmail.com. Have you used an R+F products? What are your faves? Disclaimer: I was gifted a 0.5 ounce container of R+F Redefine Multifunction Eye Cream in exchange for an honest review. I also happily agreed to help Jenna promote her small business. However, all opinions are my own! I haven't used any products by R+F, but I've heard great things. I can tell a difference for sure. Your skin looks great! I can see a difference! I've been wanting to try R + F forever but I'm just not sure it will work and it's alot of money to invest (but I guess you don't know until you try!) I'll be keeping your friends info. I did a blog post on R+F earlier this year, I gave it an okay rating but honestly if I could go back and rewrite my blog post after using the product for more months, I would give the product a much higher rating. That eye cream is awesome and if you stick with it, you will see even more results, I have. I really like the Redefine Face Wash, it smells great and is like a mini facial since it has a 2 min mask in it. 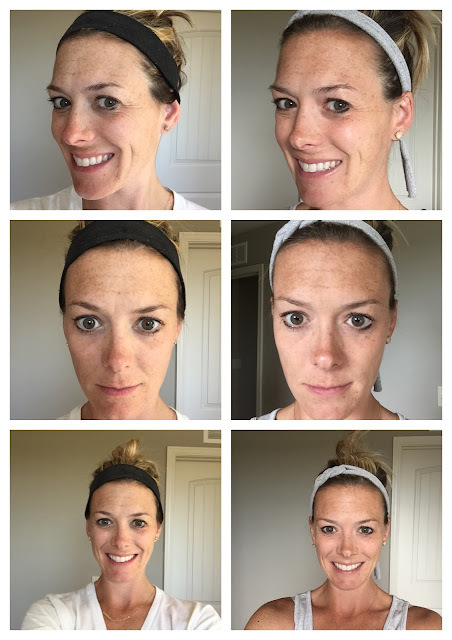 I've tried the Age Reverse and again didn't think it was that great but now I want to order it again and try it for longer, I've seen pics where people's freckles totally disappear with usage. I have the foamless tanner but haven't used it yet. I'm already a perks member but that's awesome that you got to try it for free! I really want to try the AMP roller so good to know it's one of your friend's favs. I have a few friends that sell R+F and their results have been amazing! I can definitely tell a difference on you! I was recently asked if I wanted to start selling r&f and I said no. I'm not so into direct sales either! I guess I would try it if I had a sample, but oh well! I'm glad it's working for you! I've heard of a few different people trying R+F with great results and while I wouldn't mind trying, it is a lot of money to spend on something and not like it. I mean, everyone that I've heard that's tried it, loves it, but you never know! I currently use Clinique for make up stuff, but I'm sure I'm not even using that to it's full ability! So about a year ago I won the eye cream on Instagram from a pretty big blogger--and she never sent the darn thing!!! She said once that she forgot and then the next time she just stopped replying to my emails. Sketch city!! Anyway, I want to try this so bad!